In 2002 I had the unique opportunity to participate to a university exchange program with an engineering school in Shanghai. On the day of my arrival I opened the local Yellow Pages and searched for a nearby Karate Dojo. Little did I know that a life-changing experience would follow. To my big surprise, even in the land of Kung Fu, there was Karate (Chinese: Kong Shou Dao). 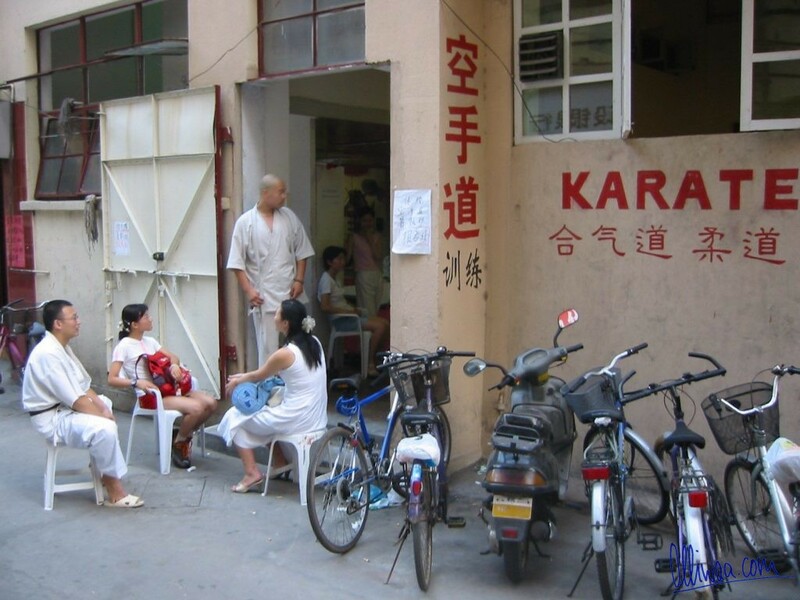 The University Shotokan Club (Da Xue Song Tao Hui) was about 45 minutes foot walk away from my residence. So, I went and asked, using hand gesture and English, whether I could join. Following a short test of my skills, in which I almost peed my pants, so nervous was I in-front of those tough and sceptical looking black belts, I was handed a student pass and permitted to stay. This experience was not comparable to anything I had seen before in Germany. 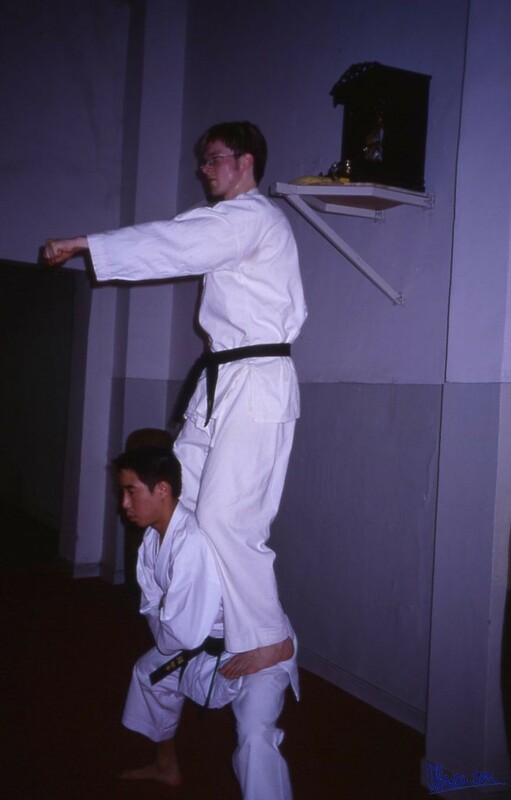 Starting with the training facility itself: the dojo was a totally run-down place with floor mats and lots of martial arts weapons on the wall, weight lifting equipment in one corner and an office desk near the entrance door, which was always kept open towards the street. Any passerss-by could peak into the room during class. No air conditioning was installed and the wall paint was about to peel off. In summer, when temperatures went above 30 degrees Celsius and humidity felt like 100%, the wooden floor boards underneath the carpet would bend. Obviously no gaps were left between the boards and the walls so that the material could not freely expand in summer. Not to mention that this place had no showers and the changing rooms upstairs were so small and the ceilings so low that a tall guy like me could hardly stand upright. Each class lasted for three hours and we trained three times per week. The style practiced was Shotokan, but again, it was nothing like the wellness sports Karate I was used to at home. It is safe to say that this was Budo Karate with a blend of Kyukushin full contact, Muay Thai and Taiji. I clearly recall one session were we kicked each other full on with Mawashi Geri in Thaiboxing style against the upper thigh – for warmup. A lot of memories have faded during the years and I do not remember all details but I will not forget the small four year old girl that was put into the splits and then pushed against the wall until her nose touched it. She was crying but did not complain. Another unforgettable memory is about my right forearm that turned all black from a huge bruise after the very first class. Obviously, I was crazy enough to ignore it and continued “Duan Lian” (training) two days later. This is not to say that I agree with everything I saw. Especially not with the way the small girl was treated but it was here that the word “Budo” got some meaning to me. Budo, literally the way of the warrior, is a term often used in the West with levity (“we practice Budo Karate”) but it almost never has any substance. Budo Karate does hurt and it is not for sports or play. It pushes you towards and beyond your personal limits and it is potentially lethal. A student from a neighbouring dojo had died during Kumite. Although this school did make me stronger it also taught me that I am not made for true Budo. 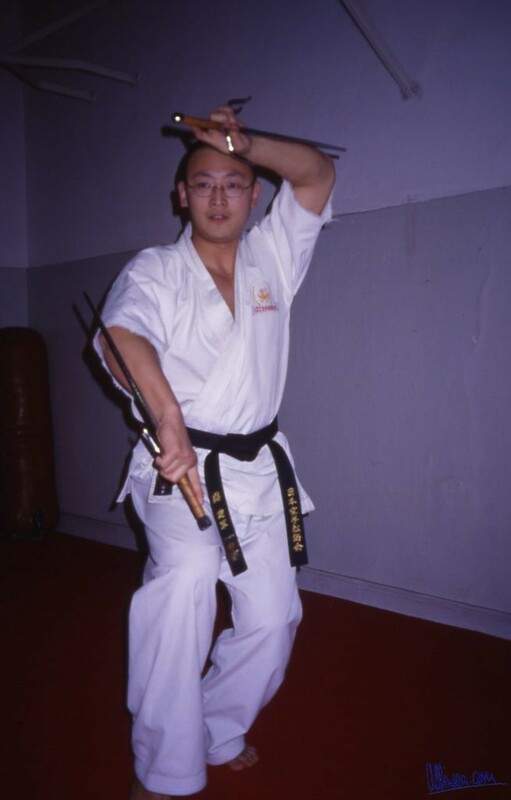 I constantly try to improve, knowing that I will never develop such toughness that some of the black belts and even Kyu grades exhibited. My bones are too weak and I am too scared to fight full contact risking a complete knock-out. The good point is I know my limits and will never pretend to be a true Budo Karate-ka. Apart from the gruelling training, one aspect was particularly impressive. Unlike Westerners who often do a hundred activities in parallel but none with their full heart and soul, Asian mentality seems to be different. The students in this club were not necessarily better or more talented than others, but what set them apart was a philosophy of “either do it 100% or not at all”. No compromise, no complaint, no nonsense. Go hard or go home. That is why the average person is so much better at Karate in China than in Germany. They simply worked harder, talked less and let Karate speak through sweat and endless repetitions. Something, which my dear friend André Bertel always emphasizes as well. The energy and dedication was simply mind blowing. Everyone here, from white to black belt was fully dedicated to training and it was not necessary to motivate anyone extrinsically. The opposite was the case, instructors had difficulties to stop people. Nevertheless, there was always a sense of humor, laughter and fun. First, beat the sh… out of each other, then hug and play, go out and enjoy life. 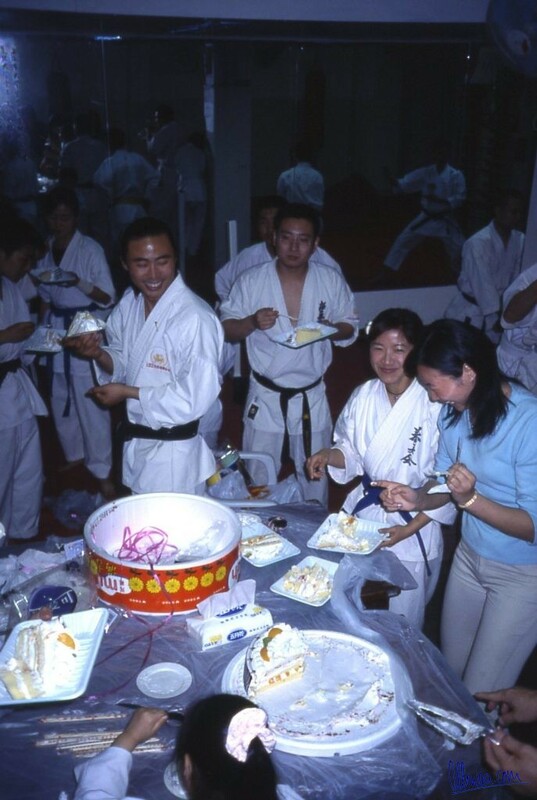 When training was over we celebrated birthday parties or just chatted and enjoyed pleasant summer evenings, sitting on plastic chairs outside of the dojo. It was an experience that will last until the end of my days. 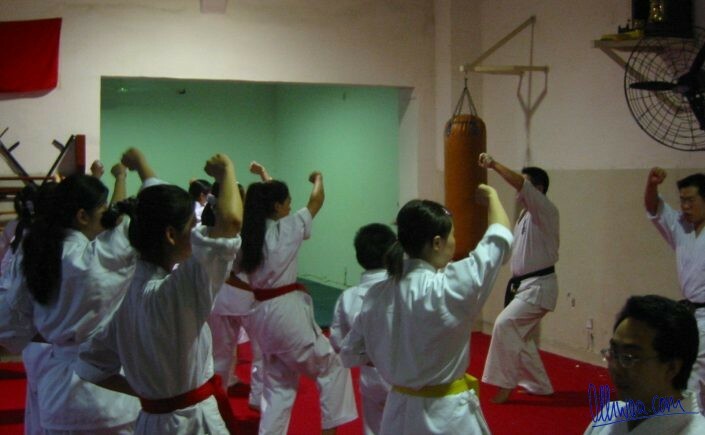 By the way, did I mention that everyone in the dojo only spoke Chinese at that time, except one person? Sensei Jiang, our Sensei, asked a young lady to take care of the foreigner (Wai Guo Ren – 外国人) and to translate for him. Ms. Lu was the only one who knew English as she taught it at school as a teacher. What can I say, my wife did a really good job back then. And what made this encounter even more magical was the fact that she had only stayed in Shanghai half a year longer than planned because of an error in her visa application for Australia, where she wanted to study abroad. The Chinese call this Yuan Fen (缘分) – “Destiny that brings people together”. P.s. : In the following years I returned many times and it made me cry when seeing in 2013 that the dojo had been demolished and replaced by a soulless glass and steel shopping center. Do you know if the guys found/build another dojo? Most Dojos are now inside skyscrapers, for example a rented space in a gym. Of course, the locations are beautiful, clean and modern but lack the soul and character of these old places. Other common training grounds are public parks where people dance, do Taiji, Kung Fu, Karate or whatever. It is very normal in China.